Iowa Federal Criminal Defense Lawyers - Oberheiden, P.C. Oberheiden, P.C. is a federal criminal defense law firm serving Iowa. Our attorneys are former high-ranking Department of Justice prosecutors who formed a critical defense team with veteran federal defense and federal trial lawyers. Call (888) 519-4897 now for a free and confidential consultation with one of our Iowa federal criminal defense lawyers. Oberheiden, P.C. as an exclusively federal criminal defense firm – our attorneys understand the litigation process and how to extract the most promising result and defend our clients against government accusations. Our staff of attorneys features many former federal prosecutors with significant federal experience. In federal litigation, the risk for criminal prosecution and sentencing is always present, including severe long-term prison sentences and substantial fines. Our law firm can help your Iowa business stay unharmed and you to avoid charges. Oberheiden, P.C.’s senior attorneys have helped hundreds of satisfied clients stay safe from prosecution. Call our Iowa federal criminal defense lawyers today for a confidential case assessment. An Experienced and Proven Federal Defense Team for All Aspects of Federal Criminal Cases in Iowa. The more time a federal defense team has, the better the chances become for a more effective defense strategy against government investigations and cases. If you have any suspicion of being targeted by federal agencies in Iowa such as the FBI, IRS, OIG, DEA, or others, contact us as soon as possible, even if you simply received a target letter or grand jury subpoena from the U.S. Attorney’s Office in Des Moines. Oberheiden, P.C. will help you understand the federal litigation process and our Iowa federal criminal defense lawyers work diligently on your behalf. If a government investigation is only considered civil – prison time is not considered an option as a penalty. However, criminal investigations are a different matter. Despite this fact, Oberheiden, P.C. can still secure an excellent result on your behalf, and by far the largest percentage of our clients has contacted us to represent them during the investigative phase. Delaying in such situations is never a good idea because the longer the government has to prepare, the worse the chances become for a favorable result such as charges being dropped. Quite often, numerous agencies work in concert as part of an investigation, such as the Department of Justice (DOJ), the Internal Revenue Service (IRS), the Federal Bureau of Investigation (FBI), the Office of the Inspector General (OIG), the Drug Enforcement Administration (DEA), and others. The first opportunity to defend yourself develops during the investigation phase and your Iowa federal criminal defense lawyers will need to accomplish two main goals during this important stage: (1) finding out which agencies are involved, and (2) finding out about the exact nature of the investigation, and perhaps most importantly, whether it is civil or criminal in nature. A grand jury subpoena is utilized by federal prosecutors in Davenport, Des Moines or Cedar Rapids, Iowa, in order to formally pursue criminal charges against defendants. If you have received such a document, your first step should be to consult with an experienced attorney. Your federal lawyer can help you understand what it means, and how to respond to it, or even challenge it in whole or in part. Experience in such situations is critical and Oberheiden, P.C. has a long history of success precisely because of this valuable experience. An experienced attorney will know which documents to produce, why, and how to effectively present yourself in front of a grand jury, if it is necessary. Don’t take the risk of hiring an unproven attorney, or someone who does not focus exclusively on federal litigation because the decision might be the difference between freedom and incarceration or huge fines. One of the most effective strategies available to your attorneys is to seek a favorable resolution prior to the trial. In fact, most charges are resolved during the pre-trial stage, and your legal defense team can help you make wise decisions in order to accomplish this. Oberheiden, P.C. has decades worth of experience working with U.S. Attorney’s Offices in order to drop charges entirely on behalf of our various clients, reaching plea bargains, and negotiating in order to secure much needed leverage. Many law firms do not take this important step, but our Iowa federal criminal defense lawyers know that no detail is too small because the stakes are simply too high. Challenging the sufficiency of the government’s overall case or the truthfulness of the government’s evidence. Contrary to what other attorneys might tell you, your fate is never predetermined, even if a guilty verdict is rendered against you or your business. Our Iowa federal criminal defense lawyers always find a way to obtain a favorable result for our clients or a way to minimize the consequences of conviction. Assuming a guilty verdict is rendered against you or your business – it does not mean you are out of options. Although grounds for appeals can be limited in a federal criminal trial, Oberheiden, P.C. has extensive experience in preserving all potential appellate arguments and maintaining an active appellate practice in addition to representing individuals and corporate defendants at trial. Iowa is divided into different federal districts. The Hawkeye State is part of the United States Court of Appeals for the Eighth Circuit (in case citations, 8th Cir.). In the United States District Court for the District of Iowa, federal prosecutors are tasked to enforce federal law on behalf of the U.S. Department of Justice. Iowa is divided into two federal districts, the Northern District and the Southern District. These districts locate federal courthouses as well as branches of the Department of Justice, so-called U.S. Attorney’s Offices. The U.S. Attorney’s Offices employ federal prosecutors, also referred to as Assistant United States Attorneys (AUSA). 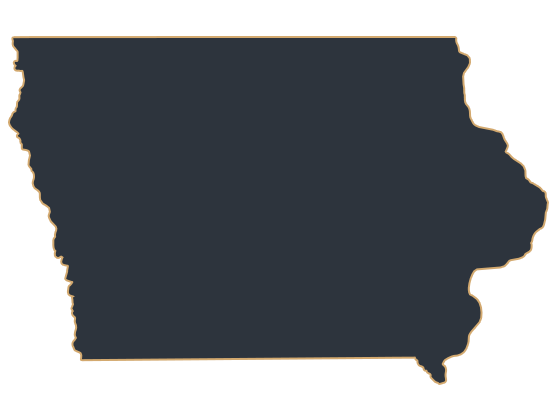 The United States District Court for the Northern District of Iowa (N.D. Iowa) covers the counties of Benton, Cedar, Grundy, Hardin, Iowa, Jones, Linn, Tama, Butler, Calhoun, Carroll, Cerro Gordo, Emmet, Franklin, Hamilton, Hancock, Humboldt, Kossuth, Palo Alto, Pocahontas, Webster, Winnebago, Worth, Wright, Allamakee, Black Hawk, Bremer, Buchanan, Chickasaw, Clayton, Delaware, Dubuque, Fayette, Floyd, Howard, Jackson, Mitchell, Winneshiek, Buena Vista, Cherokee, Clay, Crawford, Dickinson, Ida, Lyon, Monona, O’Brien, Osceola, Plymouth, Sac, Sioux, and Woodbury and it hosts federal courthouses and U.S. Attorney’s Offices in Cedar Rapids (111 Seventh Avenue SE Box 12, Cedar Rapids, IA 52401-2101), and Sioux City (320 Sixth Street, Sioux City, IA 51101). The United States District Court for the Southern District of Iowa (S.D. Iowa) covers the counties of Adair, Adams, Appanoose, Boone, Clarke, Dallas, Davis, Decatur, Greene, Guthrie, Jasper, Jefferson, Keokuk, Lucas, Madison, Mahaska, Marion, Marshall, Monroe, Polk, Poweshiek, Ringgold, Story, Taylor, Union, Wapello, Warren, Wayne, Clinton, Des Moines, Henry, Johnson, Lee, Louisa, Muscatine, Scott, Van Buren, Washington, Audubon, Cass, Fremont, Harrison, Mills, Montgomery, Page, Pottawattamie and Shelby and it hosts federal courthouses and U.S. Attorney’s Offices in Des Moines (123 East Walnut Street, Des Moines, IA 50309) and Davenport (131 East 4th Street, Davenport, IA 52801). What Are Conditions for Pre-Trial Release? – The first task for our Iowa federal criminal defense lawyers will be getting you out of jail if you have been detained pending trial. Oberheiden, P.C.’s attorneys understand how to create a strong legal defense and how to secure bond in federal cases. Federal Grand Jury Subpoena Defense – A federal grand jury, much like a federal case, is very different from a state case, or petit state jury. Effectively responding to a grand jury subpoena is a complicated and serious matter. Read about what an experienced attorney could do for you in such situations. What Are My Options after Being Federally Indicted? – Even if you have been federally indicted, you still have numerous options on the table. Learn about the possibilities to shield yourself from federal prosecution, from seasoned federal defense attorney Dr. Nick Oberheiden. What Is the Burden of Proof in Federal Criminal Cases? –Discover what “beyond a reasonable doubt,” could mean for you, and how a jury might judge your innocence if the case reaches the verdict stage. Remember, in a federal trial, the burden of proof is on the government, and your defense team could take advantage of the situation to secure a good result on your behalf. How to Prepare for a Criminal Trial –Find out how even everyday actions such as posting on social media could negatively impact your case, along with more serious offenses such as destroying evidence. Read about the options at your disposal and how you can prepare yourself for trial in order to improve your odds. Preparation is key, especially when it comes to a federal criminal trial. How Can I Prepare for My Sentencing Hearing? –Find out how you can prepare yourself for the possibility of a sentencing hearing and potentially insulate yourself from maximum fines or penalties. Q: What should I do if I have received a subpoena or target letter? As soon as you receive a target letter or subpoena from the Iowa U.S. Attorney, the IRS, OIG, DEA, DOJ, or FBI, make sure to contact your attorney. Such notices could be a signal that you are the subject of a major federal investigation, which needless to say, is an extremely important matter. At Oberheiden, P.C., our experienced Iowa federal criminal defense lawyers have seen it all and can counsel you on the next steps to take if you are the target of a government investigation. Q: If I have been indicted, do I have any chance of avoiding a conviction at trial? Yes, even if you have been indicted – avoiding conviction at trial is still possible. Q: How do I know if my investigation or charges are civil or criminal in nature? Through the help of our attorneys – we can help you determine if your investigation is criminal or civil, because the difference is extremely important. Oberheiden, P.C. will counsel you throughout the process and advise you on the next steps to take in order to achieve the desired results. Q: What can I expect during a free case assessment? Our attorneys take the time to explain your next steps and options. When you contact us, we will give you a free and confidential consultation and explain which strategies we would employ if we were your legal defense team. Do not hesitate to contact our Iowa federal criminal defense attorneys today. Contact Our Iowa Federal Criminal Defense Attorneys at Oberheiden, P.C. If you need a Iowa federal criminal defense lawyer, we encourage you to contact us immediately to schedule your free case assessment. To discuss your case in confidence, call us at (888) 519-4897 or send us your contact information online now.